On Sale Now! 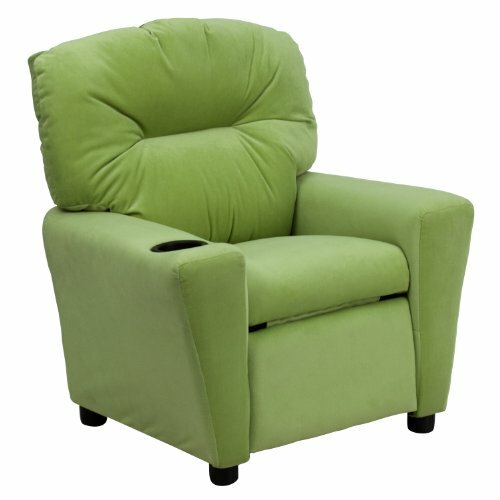 Save 3% on the Flash Furniture Contemporary Microfiber Kids Recliner Avocado by Flash Furniture at Indsight. MPN: BT-7950-KID-MIC-AVO-GG. Hurry! Limited time offer. Offer valid only while supplies last. Web exclusive! After hopping from the classroom to the bus to the playground, your child will love kicking back and relaxing in this kid-sized chair. Web exclusive! After hopping from the classroom to the bus to the playground, your child will love kicking back and relaxing in this kid-sized chair. The soft foam and microfiber upholstery make for a comfortable feel while the addition of a cup holder in the armrest allows them to enjoy a refreshment without moving an inch. Place this petite recliner in the living room or their bedroom and they'll feel just like a grownup.